Single-mode fiber optical receivers have become the instrumentation standard for Dynamic Light Scattering (DLS). In a regular homodyne experiment one values their superb signal-to-noise ratio as well as the simplicity of the optical setup. Moreover, mode-selective DLS enables the researcher to tackle seemingly hopeless experimental problems, such as colloidal motions inside an opaque porous medium consisting of a water filled packing of small glass grains. The particles to be measured are completely masked by strong diffuse scattering in the porous matrix. Nevertheless, mode-selective DLS makes it possible not only to detect the motions of the colloids within the pores but also to determine their diffusion coefficient and, simultaneously, their average convective speed. 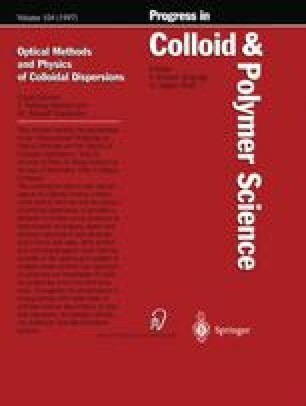 We outline the theoretical background of these measurements and present data on diffusion and convection of latex particles in dense packings of glass-beads in a Chromatographic column. Our technique allows an accurate determination of the tortuosity of the interstitial flow.